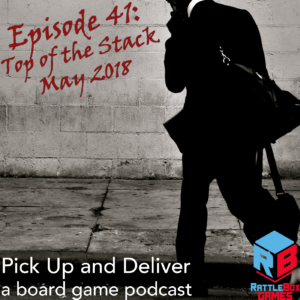 Brendan discusses his game plays in April, reports on his last top of the stack and reveals the new one, and does a 10 for 10 update. Games! Games! Games! The ten for ten is coming along. I’ve italicized the game(s) that we’ve made 10 plays of. What do you do with games of which you’ve exhausted the gameplay? Let us know over on BoardGameGeek in our Guild, #3269.